77 million people were born between 1946 and 1964, which is defined as the baby boomer era (U.S. Census). 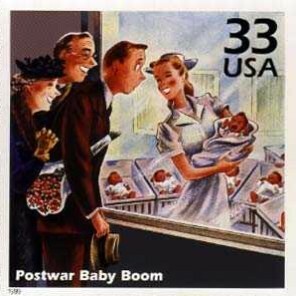 The first baby boomer turned 65 on January 1, 2011. The senior age group is now, for the first time, the largest in terms of size and percent of the population in the U.S. This age group grew at a faster rate than the total population between 2000 and 2010, according to a 2010 Census brief. The NAHB predicts that the aging in place remodeling market to be $20-$25 billion. That’s about 10% of the $214 billion home improvement industry. From 2004 – 2009, the number of seniors age 65+ actively using the Internet increased more than 55% (Nielsen). Adults 50+ spend an average of $7 billion online annually (SeniorNet). Only 1 in 3 adults in their 50’s have attempted to create a retirement plan (Lusardi & Mitchell). Most adults 45-54 do not feel they have saved enough money, early enough, to be prepared for retirement (American Century Investments). Boomers caring for aging parents spend 150 minutes per person each month viewing 1,010 pages of content – 70% more than the average user (United Healthcare, National Alliance for Caregiving). In the next ten years, U.S. baby boomers will increase their annual spending on wellness-based services from approximately $200M to $1 trillion (Paul Zane Pilzer, The Next Trillion).